Your tooth is a complex structure anchored into your jawbone by its root. When your root is extracted due to infection, there is no natural way to connect the tooth to your jaw. A dental implant is a substitute tooth root that serves as a foundation for a crown (prosthetic tooth). This will restore the function and appearance of your tooth, matching the exact color and shape of your other teeth. These problems are associated with bone resorption, which is the progressive deterioration of your bone that causes your jaw to shrink. Can I Get Dental Implants on Single, Multiple, or an Entire Set of Teeth? Dental implants are very versatile and can restore a single, multiple or entire set of teeth. Baltimore patients with missing or lost teeth may require preparatory surgery to replace bone that has been lost to resorption. During your initial appointment, an oral surgeon will evaluate the condition of your jaw prior to placing implants. Permanent. Designed to last a lifetime, dental implants are the most effective option in the long run. Documented clinical research shows that dental implants have a success rate of over 95%, much higher than other options such as tooth-supported bridges and partial or full dentures. Preventative. Bone resorption is one of the most common problems associated with a missing tooth. By replacing the root of your tooth with a dental implant, your jawbone and face retain their shape. Healthier Smile. Bridges and partial dentures can damage surrounding teeth over time. Dental implants create a separate structure, affixing a crown to a secure base rather than nearby teeth. Natural Appearance. Dental implants were developed with your natural smile in mind. Your surgeon will be able to match the shade of your teeth and place your dental implants in a position that supports the force of chewing and maintain the proper alignment of your teeth. Low Maintenance. Caring for your dental implants is just like caring for your natural teeth. You’ll be able to brush, floss, and come in for routine check-ups. A bridge or dentures will require removal and take additional time and products for cleaning. Ultimately, dental implants will function the same way as your natural teeth, allowing you to enjoy any type of food without risking damage. Because dental implants are permanent, you run no risk of bone resorption. What Will Happen During My Surgical Evaluation for Dental Implants? Quality and quantity of available bone. Number of dental implants needed. Other procedures that may be needed to prepare the site. We use state-of-the-art technology such as iCAT 3D cone beam imaging to obtain the most accurate, detailed view of your teeth bone and facial structure. 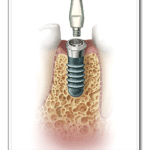 Bone Grafting: Required for Baltimore patients who have a significant amount of bone loss, bone is taken from another area of the mouth or synthetic material is used to improve the site to stabilize the placement of implants. 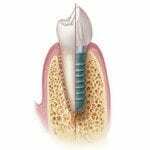 Most patients can combine this procedure with implant placement and heal from both surgeries simultaneously. 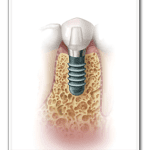 Implant Placement:After administering anesthesia to prevent any sensation during the procedure, your oral surgeon will gently insert the dental implant. Patients will be provided with a set of temporary teeth while the permanent set is created. It will take several weeks for the bone to grow around your implants. During this time, you should manage pain with over-the-counter pain relievers such as Tylenol and eat softer food to avoid discomfort. 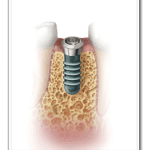 Abutments and Replacement Teeth: Once your dental implants have fused to the bone, your surgeon will attach small connector posts called abutments to each dental implant. Your new teeth will then attach to these abutments to complete your treatment. Dental implants are a permanent solution to restoring the function and appearance of your smile. The Maryland Center’s board certified oral surgeons are considered among the top specialists in the region and will support Baltimore patients with exceptional care throughout their treatment. To schedule a dental implant consultation, call one of our Baltimore area offices: Hunt Valley office at 410.666.5225, Owings Mills at 410.363.7780, or Bel Air at 410.838.7301.